Home » All food » Why Is My Table Salt Pink? At a trendy restaurant which specializes in catering to the health conscious palate, you reach for the salt dish. What a surprise when you remove the lid. The salt is pink! What’s up with that? Sea salt is available in a number of colors including white, brown, pink, and gray. The different colors are caused by variations in mineral content. Sea salt can contain any combination of the following minerals: iron, calcium, magnesium, potassium, manganese, zinc and iodine. 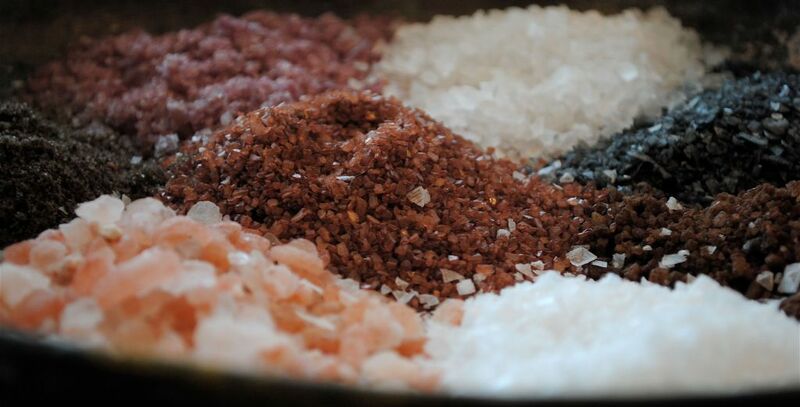 VegKitchen talks about the differences in salt types in, A Guide To Salt Varieties. Image copyright by Larry Hoffman and modified by author. Used in accordance with Flickr.com license. The distinctive pink color of Himalaya salt comes from the iron oxide inherent in its composition. This piquant crystal is pretty on the table when ground fine. It is also available in a courser texture, such as that found in kosher salts or rock candy. A novel use for it is in salt candles. Does Himalaya salt possess any health benefits? One of the most important is that of iodine content. Sea salt contains naturally occurring iodine. Iodine is necessary in the human diet to prevent deficiency associated conditions such as cretinism, impaired thyroid hormone synthesis, and/or thyroid enlargement (goiter). According to Unicef, “In 2013, more than 35 million newborns were unprotected from the lifelong consequences of brain damage associated with iodine deficiency.” The prevalence of Iodine deficiency is discussed in, Medscape’s iodine deficiency report, Iodine Deficiency. There are multiple other benefits from using pink salt. Empowered Sustenance provides details for further benefit in, How to Use Himalaya Salt. Common salt is produced world wide. Wikipedia lists the ranking of global salt production. Since I use Himalaya salt regularly in my cooking, I discuss it from time to time in my Hubpages articles (hubs). One of those hubs is my fifteen bean soup recipe. You can get a picture of salt production at Statista. Image copyright by salty chip and modified by author. Used in accordance with Flickr.com license.